(NaturalNews) The year is 1847. Physicians in America are not enjoying competing with inexpensive, natural remedies, which are offered by Indians and skilled midwives. These are remedies which are very effective but are not profitable, nor patentable, so the physicians get together to form an alliance called the AMA, the American Medical Association. Only "regulars" were allowed to join this new, prestigious organization, which strictly excluded herbalists, homeopaths and Indian doctors. The new bylaws enacted would ensure that any physician caught dealing with a "non-regular" would be cast out and his reputation ruined. There was only one problem, and it was a huge problem. Conventional medicine in America was based on philosophy, not science, because nothing had been tested. We know this as a cold hard fact today. The kind of medicine regarded as conventional then consisted of blood letting, mercury poisoning, and other methodology we laugh at today. Word started getting out. Doctors from Europe who visited and then returned home told others of the ill health of the average American, whose skin was sallow, eyes sunken, and teeth and jaws crooked. Lo and behold, these are all symptoms of mercury poisoning. And so there you have it. United States healthcare started with mercury poisoning! That's why it's still in vaccines and flu shots, because they can get away with it. In 1905, Collier's magazine published an expose on the "patentable remedy industry," in a series of articles called The Great American Fraud. But by then, it was too late to stop the tsunami of criminal conspiracy that was crashing in on natural medicine. The AMA had created the Department of Investigation (DOI) to hunt down doctors still using natural remedies. The department's sole job was to shut down ANY HEALERS who could threaten AMA profits. The AMA's thug department "DOI" actually kept files on anyone who was cured of cancer. They also kept files on health foods, vitamins, acupuncture, faith healing, and Scientology. The head of the AMA, one Morris Fishbein, was a criminal and an extortionist, and if you did not pay him large sums of money for the AMA "Seal of Acceptance," you simply could not survive in the medical field. Fishbein was the ultimate scam artist. The AMA never even had any facilities to test any of the drugs on which they put their "Seal of Acceptance" anyway, so it was all a huge scam. April, 2001: Three state medical societies join together with over 75,000 members and sue the nation's largest health insurers. 12 different health plans and their so called "managed care" authorities were violating federal racketeering laws. 20 individual doctors from seven states accused managed care companies of denying medically necessary treatments, systematically delaying payments, and bundling claims. Bundling means they were making piles of claims they didn't want to pay on and denying them without review, all to keep money from physicians so the company could profit. The end result: The HMO insurers "managed care" practices had violated the Federal Racketeering and Corrupt Organizations Act. The HMOs AUTOMATICALLY "down-coded" and "bundled" claims, which was done with software which had protocols set by the American Medical Association itself, well in advance. This enabled the mass manipulation of reimbursements. The conviction marked the third time that the AMA was found guilty of antitrust violations for CONSPIRACY. In America, we call it a "repeat offender," and usually THREE STRIKES AND YOU'RE OUT, and so that person gets life in prison or execution in some states. But corporations, federal commissions, regulatory agencies and politicians simply pay fines, settle out of court, or get pardoned. The American people, for the most part, are so oblivious to medical corruption that even when the BIG CATS do get busted red-handed for quackery and racketeering, they still go right back to the same doctors for magic pills, surgery, chemotherapy, and radiation, believing there's some miracle cure for their bad diet and learned helplessness. A racketeer is a person who commits crimes, like those of extortion, bribery, or loan sharking. Yet, to most Americans, the concept of "nonprofit" goes hand-in-hand with trust. After all, if an organization isn't driven by money, they must be trustworthy! This is where false advertising takes over. The AMA is a nonprofit agency which gladly accepted huge sums of advertising fees from tobacco companies who advertised heavily in the Journal of American Medicine throughout the 20th century. After scientific PROOF came in about the dangers of smoking and development of lung cancer, the AMA still ran ads that quoted doctors talking about smoking their favorite brands, and other ads claiming Camels were good for digestion! The AMA paid salaries and expenses for a team of medical doctors and lawyers to covertly destroy the entire chiropractic profession in the United States, and this is not some conspiracy theory or accusation. In 1990, four chiropractors won a landmark antitrust lawsuit where the court ruled that the AMA had violated the SHERMAN ACT. According to a 1998 article in The New York Times, the AMA paid Sunbeam Corporation nearly $10 million to avoid a breach-of-contract trial. The AMA was going to endorse Sunbeam's blood pressure monitors without any plans to test them. The AMA only pulled out of the plan once the public knew. This is simply deja vu of Fishbein's fake seal of acceptance. That huge lie was SETTLED OUT OF COURT also in 1955 by the AMA, just like the Sunbeam lawsuit. After the case, the AMA said it was "now fully focused on its historic mission to serve America's patients and the quality of American medicine." So what was it before that? To make money and lie? Would you trust the AMA, the FDA and the NCI (National Cancer Institute), organizations whose administrators and heads bounce back and forth, from Big Pharma CEO jobs to running the government rackets that regulate food and medicine safety? The infamous AMA "Seal of Approval" is exactly the same situation as we have today with the FDA, where approval of pharmaceutical drugs requires millions of dollars up front, but no real testing is done, and the heads of the FDA are former presidents and vice presidents of pharmaceutical and chemical companies that engineer and market these same untested, dangerous synthetic drugs. Then when the FDA gets caught, they simply give the victim's family a couple million (from their billions) to shut up. For those inclined to place trust in the AMA, just take a look at the association's history. Even today, the AMA continues to make decisions obviously designed to protect organized medicine, not patients. So what's the moral of the whole story? 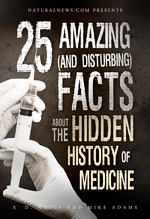 Since before World War II, Americans have been falsely reaffirmed by the FDA, AMA, and NCI that conventional medicine is based upon science, and it's all a big lie. Seek natural remedies!